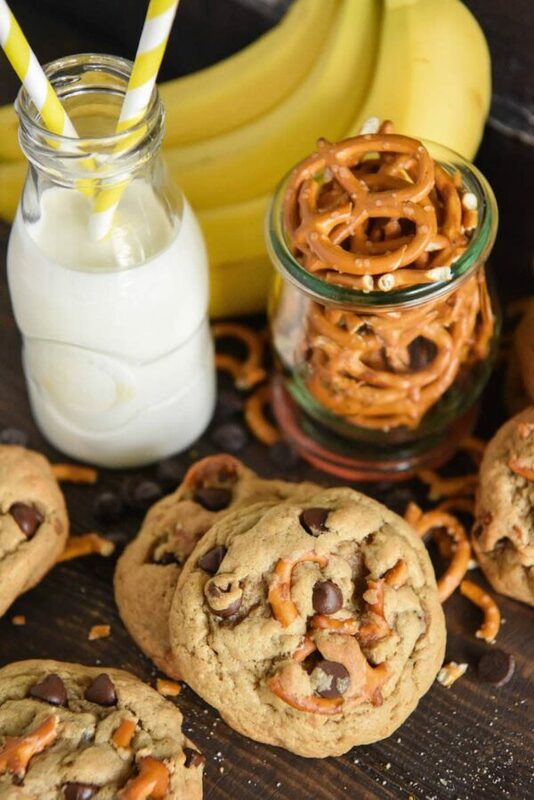 Chunky Monkey Cookies: soft peanut butter and banana cookies are loaded with chocolate chips and pretzel pieces to create the best sweet and salty cookies ever! Salty and sweet desserts have been my kryptonite this pregnancy and cookies are always a good idea. So when I had some bananas that were just a little too soft for us to eat regularly, I knew what I was going to do. No, not banana bread — even though I make a mean Peanut Butter Banana Chocolate Chip Bread! And no, not the now famous Nutella Banana Swirl Muffins OR the Coconut Banana Crunch Muffins! Can you tell how much we love bananas around here?!?! I wanted to make cookies! 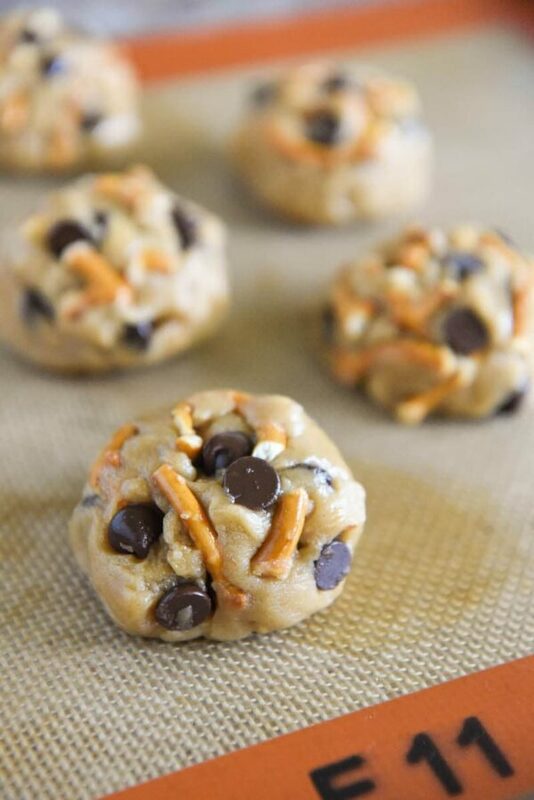 Specifically Chunky Monkey Cookies – perfect combo of salty and sweet. We eat so many bananas around these parts and obviously I have a ton of recipes to use up any leftovers. But I had been craving cookies like crazy, so I knew I had to come up with something different. I based the dough for these off of my favorite outrageous Reese’s Peanut Butter Cup Cookies. But I cut back on some of the butter in the dough and added banana instead. Then I folded in a bunch of semi-sweet chocolate chips and salty pretzel pieces. Whoa mama, were these good. Delicious straight out of the oven and still soft days later! But then again, I just love anything that has that salty and sweet combo. 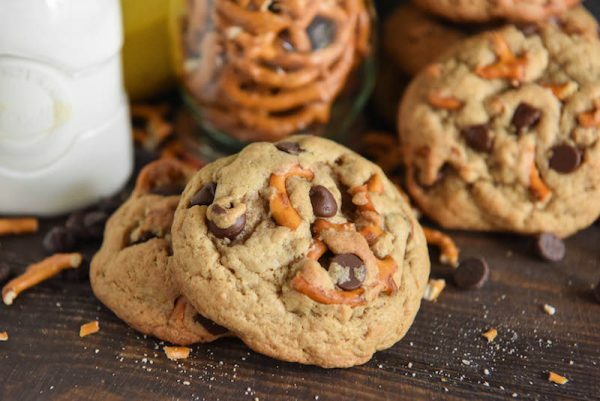 Plus the crunch of the pretzels really give these cookies a little something extra! We tore through the first batch of these and the next week I found myself making them again once our bananas went just past their prime. You don’t want to use super soft/ripe bananas, but you can use either fresh bananas or just a little too soft bananas. Just make sure and mash them up fine no matter what type you use! I developed this recipe for Dixie Crystals, s op lease head over there for the full recipe! The recipe does not give the measurement for choc chips. Thank you for catching that! I am having them update it – in the meantime, it’s 1 cup semi sweet chocolate chips! I don’t like banana flavored foods. How much butter did the original recipe have? I’d rather do that. These sound really good. You can swap 1/2 cup of the mashed bananas for 1/2 cup more butter. Oh my gosh this is the perfect combo, the kids could not get enough! Yay! So glad the kiddos loved them Amanda! I love salty and sweet treats! These look amazing! These look yummy, love the added crunch! I would love to try this! Looks really good!! YUM!!! I love the sweet & salty combo! 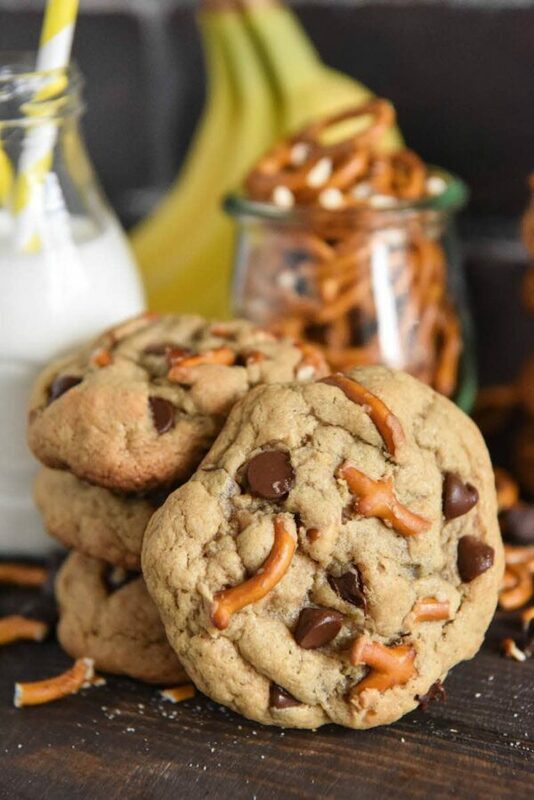 Craving for these yummy Chunky monkey cookies! This is really a great ideas! My kids will devour these in minutes!